Will Auto Insurance Pay Me If My Car Is Stolen? It’s your worst nightmare: you go out to your driveway, the parking lot, the street, or wherever you may have parked your car, only to find that it isn’t where you left it. You know that you someone didn’t borrow it, and you are frantic when you come to the realization that someone stole your car! Will Your Car Insurance Cover a Stolen Vehicle? If your car has been stolen, you might be thinking to yourself, “I have insurance, so I’m covered.” But that’s not necessarily the case. Why? – Because it depends on what type of car insurance you have, and not all types of coverage will pay you if your car is stolen. A comprehensive policy is the only type of insurance that will pay you if your vehicle is stolen. So, while you might have liability coverage, or even collision coverage, don’t expect to receive a payout from your insurance company. Liability insurance only covers the cost of third party injuries and property damage. In other words, if you are involved in an accident and you are at-fault, your liability coverage will help to pay for any injuries that people in the other vehicle sustained, or the damages that were inflicted on the other car. It will not cover your vehicle or your injuries. Collision coverage only covers the cost of damages to your car if you are involved in an accident. Say you were responsible for an accident, whether it was with another vehicle or you ran into a pole, a mailbox, or even a building, your collision policy will help to pay for the damages to your vehicle. If you want to protect yourself from theft, then you are going to need to invest in comprehensive coverage. Comprehensive auto insurance is designed to protect you from damages to your car that are the result of events that are not related to a collision. These events can include things like flooding, vandalism, hail, a fallen tree, or even a run-in with an animal. It also protects you if your car if your car is broken into and damaged, or if it stolen. Comprehensive auto insurance is an add-on coverage. In other words, you will need to purchase an additional policy; don’t assume that you have this type of coverage just because you have liability and/or collision insurance. Comprehensive coverage is a separate policy. And, if you do purchase this type of insurance, you need to check with your provider to ensure that the policy covers a stolen car. 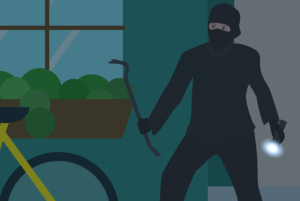 Again, don’t automatically assume that a comprehensive policy will cover theft; it may not, and if it doesn’t and your car is stolen, you will not be compensated. The best way to protect yourself in the event of theft is to invest in a comprehensive auto insurance policy. As mentioned, this is the only type of auto insurance that will reimburse you if your car is stolen. But, as mentioned, make sure you check with your provider to ensure that your policy does, indeed, cover theft. You don’t want to assume that theft is covered, only to find out that your car is stolen, and your policy doesn’t include theft. Investing in anti-theft devices. There are several after-market anti-theft devices that you can have installed in your vehicle, and many of these products are highly effective. Be aware. Make sure you are wise about where you park your vehicle. A locked and highly secure garage is the safest location. If you don’t have access to such a location, park it in an area that is highly visible, such as near street lamps, or near security. Lock your vehicle. Always make sure that your vehicle is locked whenever you are not in it. Also, make sure that the windows are rolled up. Never leave your keys in the car. Of course, leaving your keys in the ignition is an open invitation to thieves. However, you should also avoid storing spare keys anywhere in or on your car, such in the glove box or in a device that is meant to hide the key under your car. Remove valuables. Take anything out of your car that would attract thieves. This includes after-market stereos, navigation systems, laptops, and any other high-ticket items that thieves would find appealing. By investing in a comprehensive auto insurance policy and taking the above-mentioned measures, you can safeguard yourself from theft.